Larry Jr.’s younger brother, Pete, is a superior high school prospect. Pete’s a 6-foot-10, 205-pound hybrid forward and an accomplished scorer who features a 3-point shot, a mid-range game and an ability to score off the dribble. He’s also a strong passer for his position. Pete, a senior at Revere High School in Richfield, Ohio, is the No. 83 player in the 2018 class, according to the 247Sports national composite rankings, and the No. 3 player in Ohio. He became Northwestern’s highest-ranked recruit in Chris Collins’ five years as head coach when he chose the Wildcats over Ohio State and Michigan last July. Asked if Pete ever ribbed his older brother about being the more highly regarded prep player, Larry Jr. smiled. Whatever Pete’s final high school ranking is, it will be higher than his older brother’s was. Larry Jr. was nowhere near top-100 lists, nor was he a high-major prospect. His final college options were Wyoming and James Madison, each a clear level below the group of Big Ten programs that wanted Pete. Recruiting, though, is a pretty similar process at every level. It is inherently pressure-filled, a process amplified for the son of a former NBA star, no matter the son’s ranking or type of offers. Larry Jr. made sure to relay that message to Pete. Even though Larry Jr. was not as coveted a player, he navigated the recruiting landscape successfully and found a fit. He averaged 11.3 points, 6.6 rebounds, 1.1 steals and 1.1 blocks per game in four years at Wyoming, while also picking up two first-team all-conference selections and reaching the NCAA tournament in 2015. His defense and athleticism helped him become a first-round pick in the 2015 NBA Draft. Pete would surely accept those results. And his older brother thinks he has found the right spot to get there. 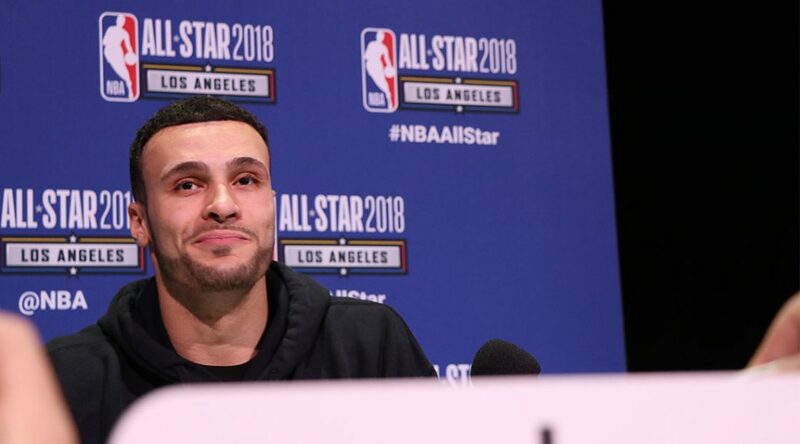 Photo at top: Cleveland Cavaliers forward Larry Nance Jr. smiles during his press conference on NBA All-Star Media Day on Feb. 17, 2018 (Serena Yeh/MEDILL).